Zsa Zsa Gabor can probably thank the Academy for helping her sell her home. "Argo," which recently snagged the Oscar for Best Picture, was partially filmed on the grounds of Gabor's estate. The listing for the home was recently updated to reflect a pending sale. Gabor's Bel Air home has been on and off the market for years with a both price cuts and price increases, ranging from a $15 million price tag to $12 million. Most recently, the home was for sale for $14.9 million. We'll see if Gabor was able to snag an offer that high. In addition to being the site for "Argo," Gabor's home was also used for the upcoming HBO film "Behind the Candelabra." The Steven Soderbergh film documents the life of Liberace and stars Michael Douglas, Rob Lowe and Matt Damon. Why all the film action at the Gabor home? Simple: Gabor's husband, Frederic Prinz von Anhalt, has taken out reverse mortgages on the property to pay for Gabor's medical care, and the two are in need of cash. According to the Los Angeles Times, von Anhalt has not been making payments on the home for some time. At one point, facing foreclosure, von Anhalt reportedly took to Facebook in desperation to ask for a loan. Getting cash from Hollywood studios seems like a better way to go. According to ReelScout, a home can earn around $1,000 to $2,000 a day when it is being set up and as much as $3,500 a day once filming begins. The Bel-Air home has a lot going for it besides a hefty amount of screen time. Built in 1955, the home was rented out to millionaire recluse Howard Hughes for most of the 1960s. 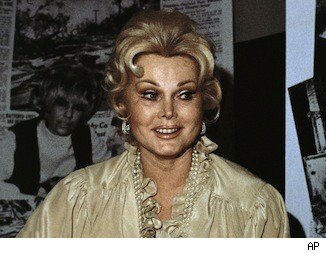 Gabor bought it in 1974, and through the years hosted celebrity and political bigwigs ranging from Frank Sinatra and Elizabeth Taylor to President Ronald Reagan and both former Presidents Bush: George H.W. and George W.
Occupying more than an acre with "270-degree" views of downtown L.A., the 8,878-square-foot home has 6 bedrooms, 5 bathrooms and large spacious areas inside and out for entertaining. Find homes for sale in Los Angeles, or search listings in your area.